Delightful Vintage Black Eyed Susan Postcard! Today I’m sharing this Delightful Vintage Black Eyed Susan Postcard! In this Printable Postcard, brightly colored Black Eyed Susan flowers stand in front of a huge glowing Sun with a smiling face inside. 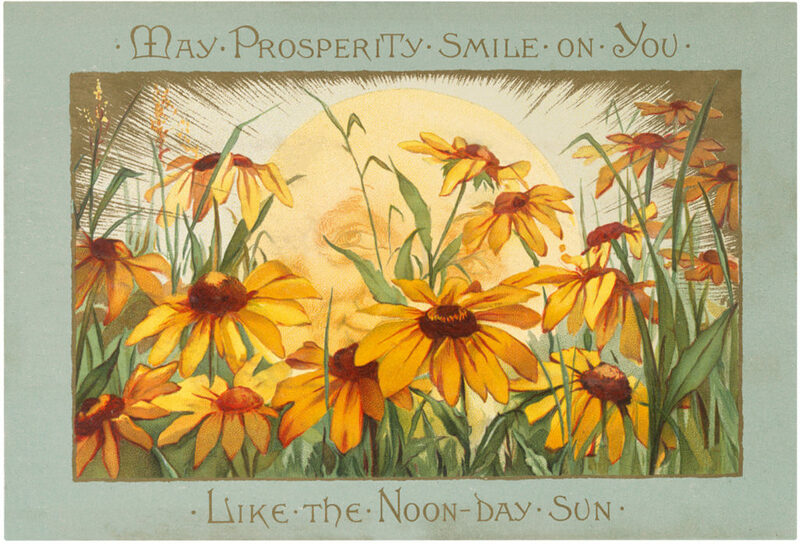 The greeting says, “May Prosperity Smile on You Like the Noon Day Sun!” So nice to frame or to use in your Craft or Collage Projects! « Vintage Woman in Beautiful Spain Costume Image! I love this black eyed Susan card with a smiling sun. I seem to have fallen off your daily newsletter list somehow. How do I sign back up? I’m getting the Friday Freebie still. So gorgeous and goes so wonderfully with lily pad image, really pretty . Think will print one of these for myself to frame. Cheerful and so happy looking, thanks for sharing this one also. Last week we bought big bundle of lathing strips to make frames, have been printing like crazy. Time for new art. Oh how awesome JaneEllen, you sure keep busy!